"It's four years later... what does she remember?" 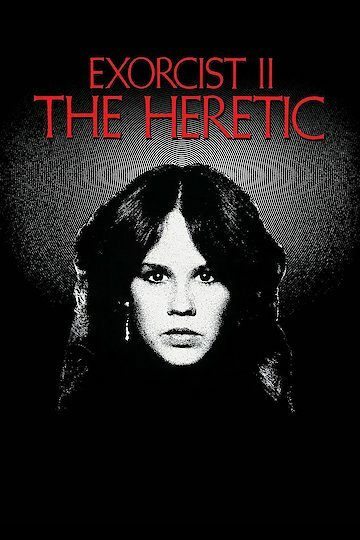 Exorcist II: The Heretic, written by William Goodhart, is a horror movie surrounding the story of an exorcism of a demon, carrying on the traditional theme of the original with a different twist. The storyline takes place four years after the original troubles of Regan McNeil. A priest that is struggling with his faith is unable to save a woman from possession. The priest is then instructed by the Cardinal to investigate the death of Father Merrin, the priest that was killed while performing the exorcism of young Regan. The film was directed by john Boorman and featured the cast that includes Linda Blair (Regan MacNeil), Louise Fletcher (Dr. Gene Tuskin), Richard Burton (Father Philip Lamont), Max von Sydow (Father Lankester Merrin), Kitty Winn (Sharon Spencer), Paul Henreid (The Cardinal), James Earl Jones (Kokumo), Ned Beatty (Edwards), Belinda Beatty (Liz), Barbara Cason (Mrs. Phalor), Joey Green (Young Kokumo), Ken Renard (Abbot), Dana Plato (Sandra Phalor), and Karen Knapp (Pazuzu). Exorcist II: The Heretic is currently available to watch and stream, buy on demand at Amazon, Vudu, Google Play, iTunes, YouTube VOD online.